Don't forget to remove *NOSPAM* from e-mail address before clicking on Send! Reprinted with permission from Good Old Boat magazine and the author, Premier Issue 1998. Once in a while you come across something that was meant to be. In some indefinable way all the parts go together, all the characteristics complement each other and the sense of cohesion and harmony is striking. 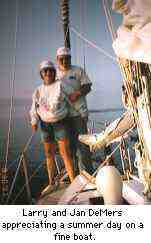 All this is true of Jan and Larry DeMers and their 1983 Cape Dory 30, DeLaMer. The boat is impressive. The brightwork gleams. The lines are spliced and lovingly done up. Inside and out DeLaMer is exceptionally shipshape. Jan and Larry complement the boat and each other, and the boat complements them. In speaking of how they selected this Cape Dory, Larry simply says, "It was meant to be." This is not the same as saying it was simple or easy. The DeMers chartered boats for 15 years, sampling different designs. Larry says they collected a $3,000 library for the study of the design characteristics of various yachts. They even chartered a Cape Dory 31 they didn't like. It was a modified hull, designed by Cape Dory instead of by Carl Alberg, and it did not have the easy motion of the Alberg designs. This did not stop them from choosing the Alberg design. In their selection, the DeMers were thoughtful and thorough, and they understood the difference. Jan and Larry were thumping DeLaMer's hull and checking out bed size and headroom in a yard near Lake Ontario on a well-remembered day in January 1991: it was the day war was declared in the Persian Gulf. DeLaMer, although already eight years old, still had all the original equipment packing boxes and user manuals. The obvious love with which she had been kept made the purchase decision easy for the DeMers. "It was like when you find the one you're supposed to marry," Larry says. "It was as sure as that." He should know. He and Jan were teenage sweethearts, and the passion has lasted into middle age. DeLaMer has a modified full keel and a cutter rig. The 140 percent genoa is roller furling, but the staysail is hanked on and has a club boom. Jan likes the rig. She says the three smaller sails are easier to handle than the two larger sails of a sloop. Larry says they didn't want roller furling but that is what DeLaMer came with, and once they'd tried the rig, they liked it. The 140 jib has a foam pad along the leading edge to help control the shape as the sail is rolled. In Larry's opinion they get good sail shape from 90 to 140 percent of the J-dimension. The roller furler is a Hood line drive which works very well. Larry cautions that it must have the proper control line, however. When he hears of people who are having trouble with this type of roller furler he always asks if they are using the original line or a replacement. The problems come when the replacement is not the one specified by Hood. His advice is to use the Yale 7/16" line specified by Hood. It splices easier and fits the drum just right. Larry adds, "Just follow the instructions." DeLaMer is powered by a Volvo MD7B 13-horsepower two-cylinder engine. 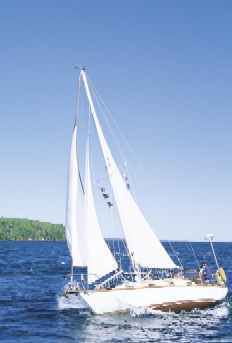 It was recently rebuilt by Alfred and Walkie Holzer of Schooner Bay Marina near Bayfield, Wis. Larry is very satisfied with the outcome and feels that Alfred and Walkie take special pride in their work. The rebuild included replacement of valve guides and seals, piston rings, fuel injectors, and the thermostat, as well as rebuilding the fuel injection pump and resurfacing the cylinder head. They found six impeller blades in the block from past water pump failures. Larry thinks Alfred and Walkie are the best. Because they sail Lake Superior's cold waters, Larry and Jan added a wood- and charcoal-burning fireplace. Larry added functionality to the space limitations inherent in a 30-foot boat by designing a navigation tabletop that folds down over the ice box when needed. The tabletop takes a full-sized chart. Jan says she likes the interior because it is not dark teak throughout. DeLaMer has a white overhead, bulkheads, and cushions which brighten the interior. With their "can-do" approach to boat upgrades, Jan took on the cushion recovering project herself. Larry says he is impressed with the quality workmanship throughout the boat. The quality of the work and finish in the areas that were not meant to be seen is very high, showing that the builders cared about what they were doing. Larry says, "As far as I'm concerned, we are liveaboards who commute to work." They have a house and jobs and run a restaurant on the side, but they try to spend 35 weekends a year at the boat including the pre- and post-season boatyard work. Jan says, "This boat has been our sanity." Jan, Larry, and DeLaMer are an impressive combination. The trio goes so well together that when Sandy and Randy Palmer sailed with them, they changed their minds about what kind of boat they wanted. They bought a Cape Dory 30 and are fitting it out much like DeLaMer. The Cape Dory is no longer in production, but there is a good support network of owners. Robinhood Marine Center has the hull mold for the Cape Dory 30 as well as complete tooling for some of the larger Cape Dorys. They will build custom boats from that tooling. The Cape Dory 30 was designed by Carl Alberg, who has had a major influence on yacht design. His designs were built by Pearson, Cape Dory, Whitby, and others. The Cape Dory is definitely traditional. She has a small interior compared to a contemporary 30 footer. There is much to be said for her in terms of seakeeping ability and ease of motion, and more than one person has said that she looks like a boat should look. Larry and Jan are happy with and very proud of their boat. When you listen to them talk about it and watch them sail, it is clear that some things, indeed, are meant to be. If you know of other good old boat sailors we should feature on these pages, please contact karen@goodoldboat.com or call 701-952-9433. Cape Dory ceased operation in 1990. Robinhood Marine Center has much of the tooling that was used to make Cape Dory sailboats and uses it to make custom yachts. Robinhood Marine Center is a good first place to look for advice or parts for a Cape Dory. Joe McCarty, general manager, says they can usually help Cape Dory owners or can refer them to other sources. They have a subsidiary called Spartan Marine Hardware which machines bronze castings from the original Cape Dory dies and molds. When it comes to spars and rigging, they recommend Rig-Rite, which bought the original Cape Dory inventory of these parts and continues to support the Cape Dory and other makes. Robinhood Marine Center, HC 33, Box 1460, Georgetown, ME 04548; phone: 800-443-3625; fax: 207-371-2024; email: info@robinhoodmarinecenter.com; web: <http://www.robinhoodmarinecenter.com/>. Rig-Rite purchased Spartan Spars from Cape Dory before the company broke up. Rig-Rite still manufactures spar and rigging items for Cape Dory boats, including the original Cape Dory stanchions, the Stearns & Hyde furling systems, and Nicro-Fico traveler systems used on many Cape Dory sailboats. Rig-Rite, 63 Centerville Road, Warwick, RI 02886; phone: 401-739-1140; email: kim@rigrite.com. Spartan Marine has continued to operate in Robinhood, Maine, making portlights, cleats, hinges, stuffing boxes, struts, thru-hulls, and such. Many of these items were original Cape Dory equipment. Replacement parts for their assemblies are also available. Phone: 800-325-3287. Triad Trailers, a former supplier of trailers to Cape Dory and its dealers, is still located in New Milford, Conn. They have custom trailer specs for the Typhoons and most Cape Dory sailboats up to 30 feet. Phone: 860-354-1146; email: triadtrls@aol.com. 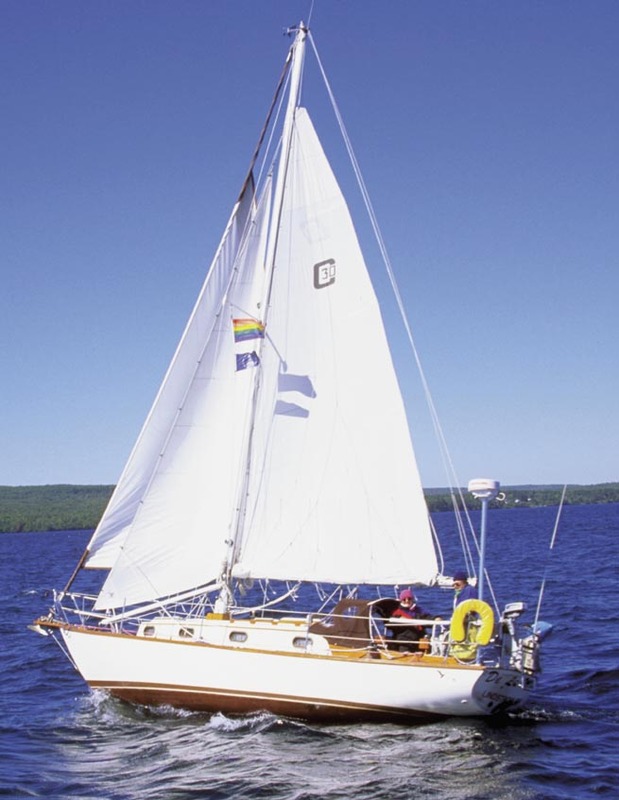 Cape Dory owners are some of the best sources of information about these sailboats. They maintain an active network of websites, publications, and owners' associations. Please refer to the information on Page 38 of Good Old Boat magazine for more information about owners' associations and publications. This information is also available on the Good Old Boat website at <http://www.goodoldboat.com>. Editor's note: It seems that whenever lists are made of the truly seaworthy boats, the Cape Dory 30 appears somewhere on these lists. (The most recent example we've seen was compiled by retired mechanical engineer John Holtrop in the April 1998 issue of Cruising World. 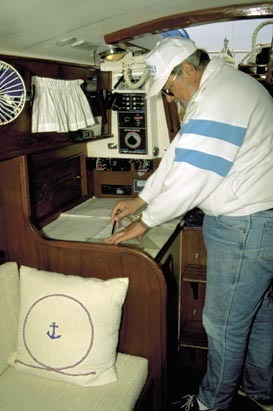 He collected data on 507 monohulls and compared the numbers to determine "critical variables" for a cruising sailboat. Sure enough, the Cape Dory 30 is on the list in the 28-33' range.) What makes this boat so special? All sailboats are a compromise of some sort. Does the CD30 have no faults? We couldn't get Jan and Larry DeMers to admit to any, so we searched a bit farther for other owners of CD30s. 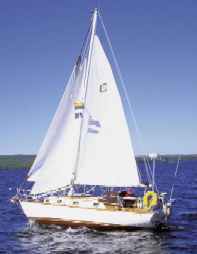 "As a ketch, our CD30 offers a variety of sail plans. Depending on sea and wind conditions, we run fully rigged with either a standard-rigged 120 jib or a club-footed jib. With the club-footed jib, pointing into the wind is not as efficient, but tacking is automatic (no jib sheets to tend) which makes 'cocktail cruising' most enjoyable. "She sails easily and well-balanced in a strong wind running just a jib and the mizzen. 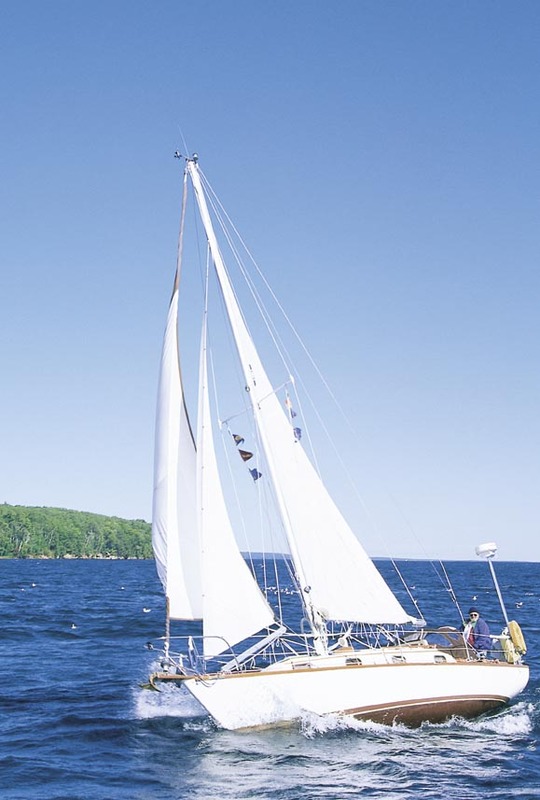 This configuration not only offers easier handling in less-than-perfect conditions, but also equalizes the strain on the main mast by balancing stress between the jib and mizzen as opposed to running just a jib. In the three years we have owned Skywind we have never had to reef a sail -- we just drop the main! "The main mast height is 38.5 feet as opposed to the cutter's 40.5 feet, which allows us more flexibility when we encounter those 'low' fixed bridges. Also, we often leave the mizzen sail up when on the hook, which minimizes our swing. A disadvantage to the ketch is that the mizzen mast, being stepped in the cockpit, takes up its share of space. On the other hand, it provides an excellent place to mount a cockpit light (and to hang our wooden parrot)! We've also attached canvas pockets to this mast which gives us a place to put our suntan lotion, cameras, etc. (you know -- 'stuff'). Haulouts can be a challenge, as there are few marinas that can perform this task without stepping the mizzen mast." Regarding the boat's auxiliary, Ed and Pat say, "We found the Volvo Penta diesel auxiliary in a sad state and with insufficient push with only 14 horsepower. The new Universal 23 HP solved that problem. We also added a dripless stuffing box which, so far, has been wonderful." Another disadvantage, which can be attributed to having an older boat perhaps, was in the deterioration of the wiring. 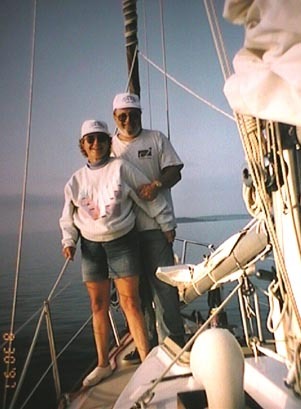 Ed and Pat report, "Over the years, the wiring that bonded the boat had deteriorated. We recently replaced all the bonding wiring and added an in-hull zinc. 'To bond or not to bond' is always an area of controversy. Case in point -- a week after the bonding was completed, we were struck by lightening! Thanks to good insurance, we were able to modernize much of our old electronics and wiring, so this was not necessarily a bad thing! We shudder to think of the large hole that may have been blown through the hull if we had not been bonded." Webmaster's note: The Cape Dory 31 is in fact an Alberg design, perhaps modified by Cape Dory. This excerpt of Larry DeMers' comments on the CD 31 should be viewed in context. See the Message Board or click here for more comments regarding the Cape Dory 31.